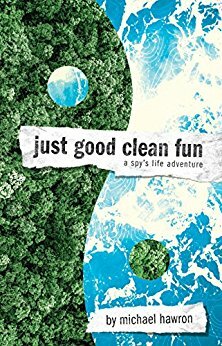 Just Good Clean Fun, by Michael J. Hawron, is a spy thriller set in the 1970s and 1980s. Like many spy thriller novels, Just Good Clean Fun follows a seemingly average (albeit handsome and charming man), who secretly has some extraordinary abilities. Those abilities allow him to fight crime, take down the bad guys, and thwart their plans, to save the world (or at least Australia). The primary character, Mitch Hawkins, is from a nondescript town, West Bush (the State is not mentioned, which just adds to his Everyman status). He had a relatively modest and average childhood, until he had his tonsils removed. While unconscious, CIA operatives changed his neurological chemistry and synapses to improve his intellectual abilities. He was destined (practically programmed) to become a spy for the CIA. This allowed him to go to MIT and gain the requisite knowledge to fulfill his destiny. While at MIT, Mitch was assigned to the Yangs group, who are tasked with overthrowing governments to further American interests. Opposing the Yangs are the Yins (also a CIA group). The Yins were tasked with keeping tabs on the Yangs and cleaning up their messes, all while holding a rather fanatical view of Americanism. Unfortunately, many of the characters feel a bit thin and seem to simply represent various spy genre tropes. The plot, as might be expected for a spy thriller novel, is the most interesting part of this book. Hawron has set his thriller within the context of an actual event from history. Yet, Hawron has followed the current popular style of making a somewhat revised history suit his story’s narrative. The plot of Just Good Clean Fun is set within the context of the overthrow of the Australian government. In reality, the parallel historical events are typically considered as a government shutdown. Though even in historical recounts, some conspiracy theorists do argue there may have been foul play. There seem to be two themes running through the book, one subtle and one obvious. First is that the title, Just Good Clean Fun, should remind the reader of something a coach would say to his team before a game. Yet, the action and consequences within the book are most certainly the opposite. The naive innocence engendered by the phrase belies the social chaos left in its wake. The second theme is the concept of dialectical forces embodied by the two groups treated as puppets by the CIA: Yin and Yang. These two groups are opposites and antagonistic toward one another but are the embodiment of non-duality. For an interesting read of the book, the reader might think of the Yins and the Yangs not as two groups within the CIA, but as a one unit serving one purpose. The book seems intended for a mature audience, not necessarily because of violent or sexual content (which are generally PG-13 on both counts), but because the nuanced alternative history of the 1970s and 1980s might not be as enjoyable for most Millennials. However, anyone who enjoys the spy genre will likely enjoy this book. It particularly has themes similar to the popular shows Chuck and Quantico. Just Good Clean Fun uses classic elements of the spy genre and adds modern elements for thrilling twists in this spy versus spy action novel. This novel is certainly good and fun, though not always clean—making it the sort of spy thriller any fan of this genre can enjoy. Interesting premise… being ‘genetically modified’ to be predisposed to working for the CIA….